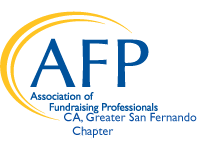 Applicants who are new to AFP may apply for scholarship by submitting a request to Board of Directors, info@afp-gsfv.org. These scholarships are usually announced in August of each year with applications generally due in October. In addition to these great scholarships, be on the lookout for discounts that AFP offers twice per year: In celebration of National Philanthropy Day and again in June. Young Professional: Open to persons who hold some degree of responsibility directly for fundraising, work within the U.S. and Canada and are compensated for their services, and are 30 years old or younger, must subscribe to the AFP Code of Ethical Principles and Standards and its bylaws and promote the Donor Bill of Rights and be employed, or have been employed by an organization that provides benefits to society. $95.00 includes chapter dues.